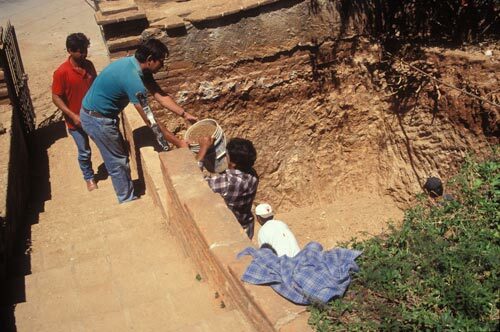 1750 was a hard year for Alamos with 6,000 people dying from the plague. King Charles III of Spain responded to the disaster by sending Inspector General of the Interior Don Jose Rodriques Gallardo who reported that Alamos has no jail, Municipal buildings or squares. Orders were given to layout streets, align houses and build a jail. 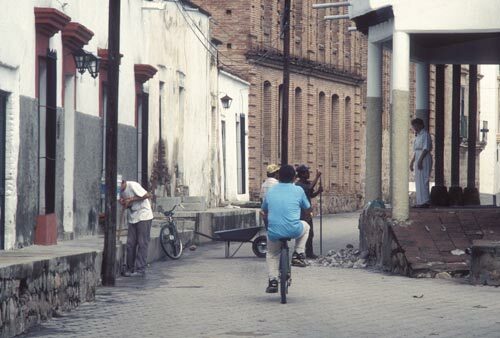 A new Alamos street-grid was designed with houses that had adjoining walls to keep squatters out of Centro Alamos. The result is what exists today, Andalucian architecture built by imported maestros from Southern Spain. The mansions’ floor plans, patterned after Roman homes, were either square, U or L shaped surrounding walled courtyards. Then is now. 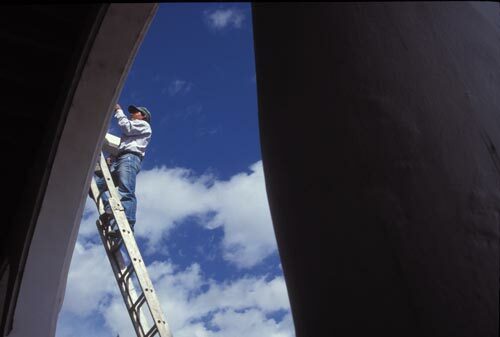 To have a roof one needs walls. 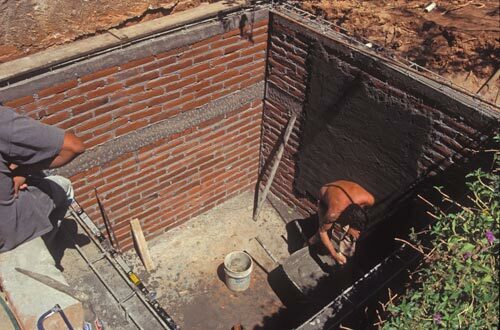 Alamos walls started with four feet of rock and rubble. 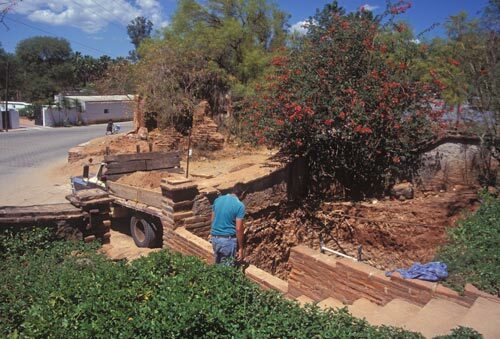 On top of the “foundation” adobe bricks stacked up to reach fifteen feet high and were two to three feet in thickness. Much of the hard labor was done by Mayo Indians. The wide walls would insulate the interiors and help support the coming roof along with plaster covered columns made of stone or fired brick. A rock blockade warns, do not continue on, there is road work ahead. 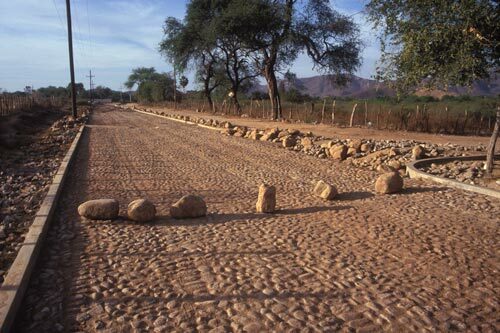 This is a cobblestone section of the old El Camino Real headed west out of Centro Alamos and then turning northwards. The airport runway is to the left and an open field is on the right. It would be interesting to learn when this important Spanish highway to the Californias went from dirt to cobble. Another time, another way exemplifies a grand human tradition of using materials at hand, and experienced intuitiveness, to create function and design. They are out early on the road to San Bernardo near the airport terminal. This is a special crew, a few men selected to continue road building and repair customs that go back centuries. 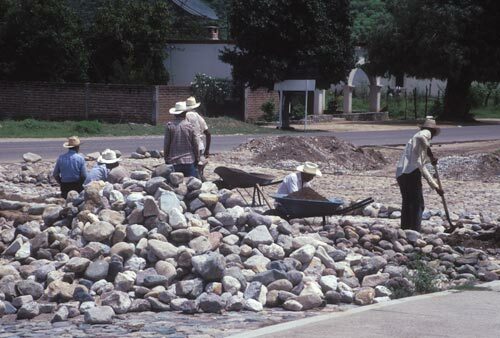 These men spend days, weeks, months and years digging rocks up and placing rocks down. My friend Chacho’s father can be seen with a hat, or wrap, under a hat. Rock, dirt, hand-tools, hard labor and minds that enjoys solving puzzles. This is an ultimate jig saw puzzle that when finished reveals no image or icon. Pieces, rocks, go where they fit, or are compatible, for a variety of reasons known only to those who position the rocks. I didn’t see any overweight men on this work detail, nor back-braces. It is hand labor: pick axes, shovels, wheel barrels, dirt, boulders and heavy lifting. There are percussive rhythms that come with their tools in repetitive action and layered human harmonies from their melodic conversation, singing and laughter. 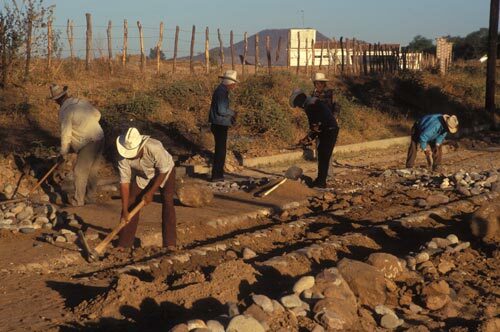 Two men with hats and a wagon load of dirt at work in the campo. 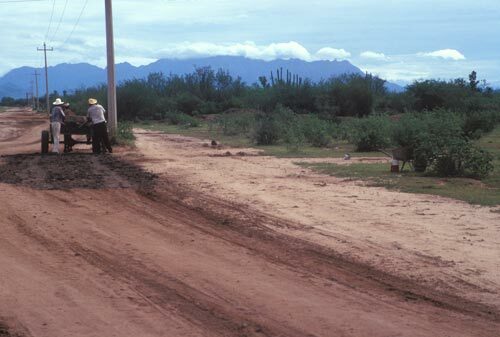 It is summer and dirt roads are quickly damaged by monsoon flash floods.. 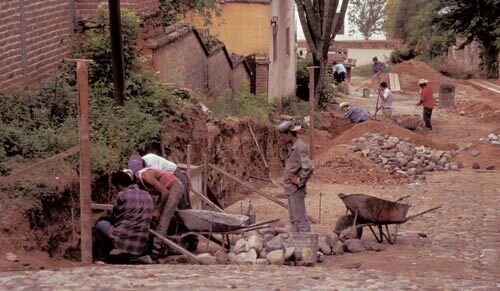 The hot sun and humidity is unavoidable but rural road repair goes – on fill the hole with dirt. Is it a special dirt or blend of dirts or…? The road looks like it is a good distance to the southeast of Alamos. I was probably returning from the Cuchujaqui River and asked the driver to stop so I could get out and take this photo. A large crew is busy digging a trench on a road going up Guadalupe Hill. 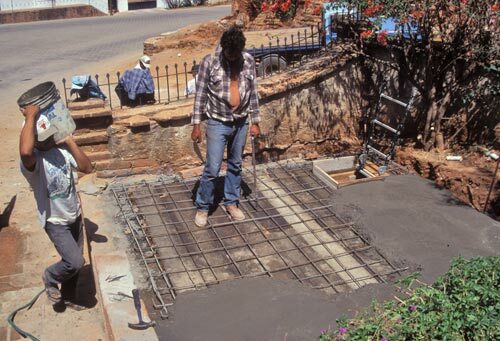 Municipal projects employ workers. Digging a trench by hand employs more workers than bringing on-site a fossil-fueled mechanical trencher. Employment grows with inefficiency and decreases with labor-saving-payroll-cutting devices. 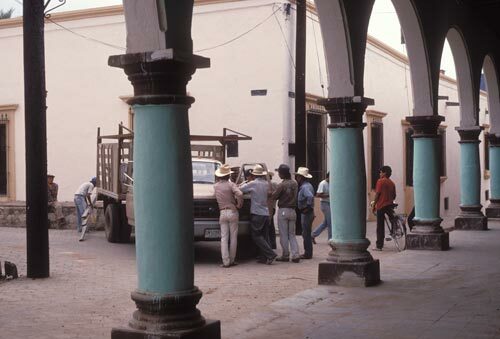 Alamos, like the all the world, needs job. 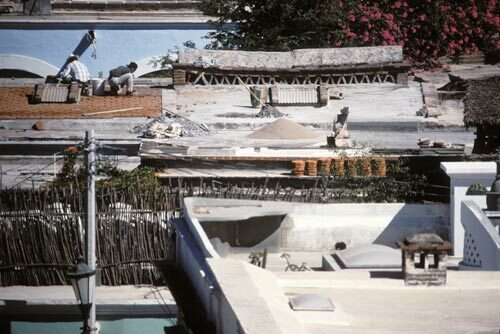 Work crews are digging on Calle Maria Felix, a street that climbs a short distance up Guadalupe hill before coming to a stop at the front door of a cliff-backed house. This is as close to being a cul-de-sac as any road in Alamos. Calle Galeana, to the west, is in the background. 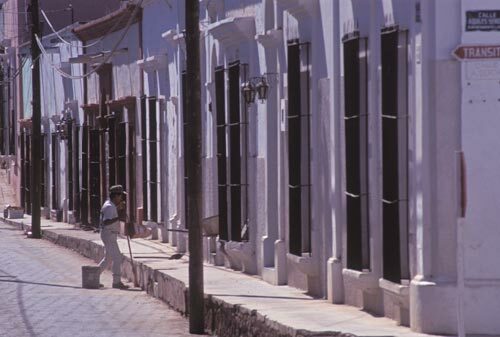 Alamos prides itself on clean streets. For some, it is a lifetime occupation. For others, it is a family chore. For all, it is a signaling that they care and they respect all of those who have, are and will travel these streets. These are serene moments. Keeping the streets clean by hand is an unending ptrocess. Clean is as clean does. There is a sense of order to freshly swept streets and side walks along with a charisma of community caring and municipal pride. The post man delivers and the street sweeper taketh away. The eastward-slow-rising-tilt of oneway Calle Aurora shows off any street debris from a distance. There is no place for litter to hide. If it is there, it’s sheer presence, no matter how large or small, casts stained shadows upon aging walls – all is influenced by its reflection. Order is disturbed. The street’s two century old character is challenged by an errant plastic cup. The illusion is gone. In this way, the street cleaners are magicians: they take us back in time with each sweep of their brooms. Order, and respect, is restored. Another sunrise, another opportunity to tidy up the streets by hand. It is morning in the Plaza. Women open their shops and offices for business and sweep their entrances. 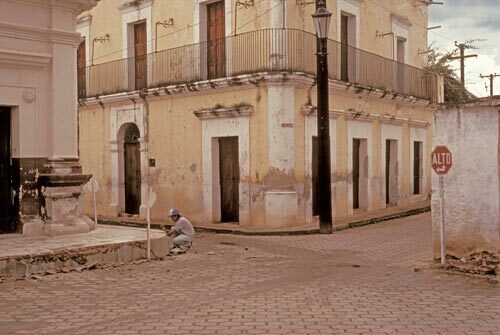 This woman is sweeping the street in front of the former Boors mansion, now a convent. It is a humble but gracious act. She can sweep away the trash and reveal the patina, if not spirit, of human travelers who have passed this way by foot, horse, carriage or car. 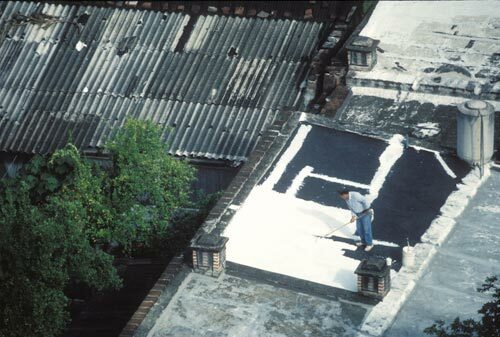 There was a 16mm film made by a North American couple living in Alamos, The Brooms of Alamos, about a girl, her true love and her eternal sweeping. 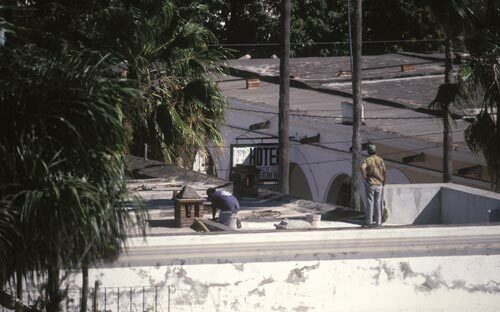 It was suggested by an Alamos contact that the filmmaker’s name was Al Gordon. 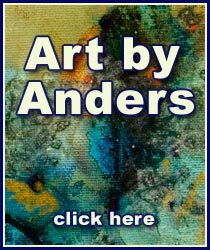 Anders had access to a film print, via Kit Nuzum, in the late 1980s or early 1990s. 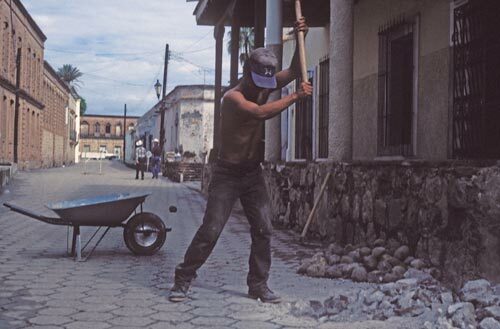 Sweeping the front yard and your half of the street is the Alamos way. Young or old clean the streets in front of their homes. 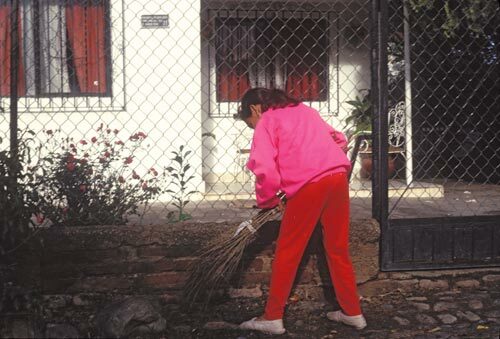 Contrast the style of clothes, and brooms, between this young girl in pink sweater and red pants and the woman above in her paisley summer dress. No matter their differences, culturally or spiritually, as they sweep they share a common timeless experience. 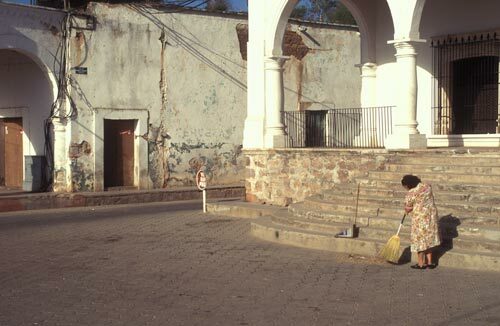 For as long as one is in Alamos there is sweeping, and as long as there is sweeping there are these Alamos streets, loved and passed on to the children. How many people have cleaned these candlesticks over the years? 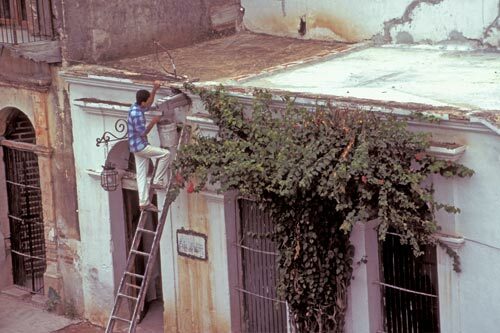 The gentlemen smiling as he works could be a cousin of Noli Ernaldo Garcia. Noli was a long time Pember and Elizabeth Nuzum employee. He was their driver and took care of household maintenance and repairs. At the time of this photo Noli had retired because of illness. The doctors’ prognosis didn’t look look good. 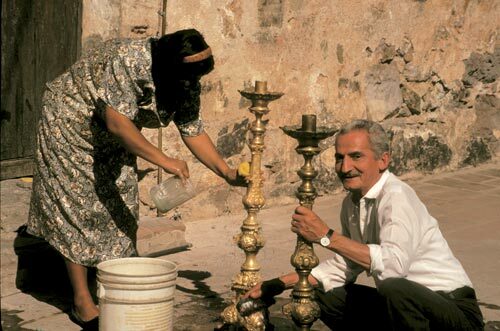 The woman helping clean candlesticks looks like she is the same person seen in a preceding photo sweeping the street in front of the Convent on the Plaza: similar dress, shoes, and hairstyle. Working together these two are closer to God, each in their own way and each on the universal path of cleaning that is life unto death.